Nayantara and Dhruv chose to break the monotony of Big Fat Indian Weddings with their tasteful backyard wedding held at a farmhouse in Pune. The entire farm house, situated on the top of a hill overlooking a lake was a perfect wedding venue for Nayantara and Dhruv’s elegance filled wedding affair. The haldi, mehndi+sangeet as well as the wedding and reception was held in the backyard of this picturesque farmhouse in Pune. Shot brilliantly by Navdeep Soni and his team, each picture from this wedding is sure to leave you inspired! 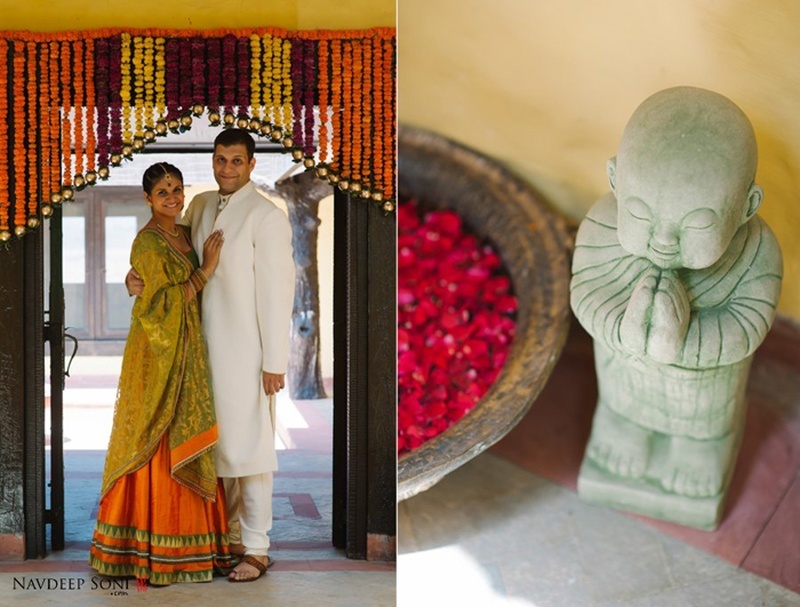 Navdeep Soni Photography captured Nayantara and Dhruv's big day just the way it had to be. Clear, untouched pictures that showed the rawness and beauty of their minimalist backyard Pune wedding. The intimate home haldi had this beautiful Indian bride painted in the holy paste from head-to-toe, just how it should be done. Nayantara wore bold floral jewellery which a lot of brides shy away from. But she pulled it off beautifully. What completely left us aww-ing our hearts out were the pictures taken with her pet Labrador! After all, canine love is true love too. After this beautiful couple sealed the deal in the sweetest way, the reception followed next, right there in the same backyard. The white marigold curtain continued to pretty up the place while all the bushes and shrubs adorned with fairy lights brought on a whimsical feel to this intimate open air affair. Nayantara looked like the epitome of elegance in her deep red kalidar lehenga paired with a sheer white dupatta and gorgeous ruby jewellery that is sure to make you rethink that diamond necklace!